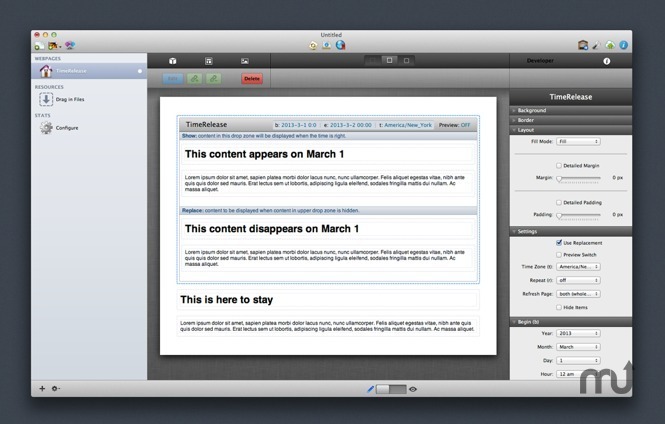 RapidWeaver stack; dynamically post and remove site content at specified times. Is there a better alternative to TimeRelease Stack? Is TimeRelease Stack really the best app in HTML category? Will TimeRelease Stack work good on macOS 10.13.4? TimeRelease Stack is like auto-pilot for your website. It is a versatile tool that allows you to update your website at just the right time while you are enjoying life away from your computer. Use TimeRelease to do one-day sales events, product launches, a schedule of events or any other scheduled update. TimeRelease Stack needs a review. Be the first to review this app and get the discussion started! TimeRelease Stack needs a rating. Be the first to rate this app and get the discussion started!